In an international airport, first class lounge, a passenger approaches the receptionist; her lovely smile warms the heart. After the being registered, she politely asked the receptionist if she can track her shipment, then she handed a piece of paper to help checking the details. In reception normally they don’t deal with weight matters, but still she navigated the system to see how she can help. From that day Anna knew, faith is a strong power, just asking God to help is not faith, to accept whatever he chooses for us is faith, giving everything up for him is faith, and its not easy to do that. المرشح الاول: مدمن كحول وتدخين يخالط سياسيين غير شرفاء، ويستشر منجما + ويعاشر خليلتين! المرشح الثانى: ينام الى الظهر، ومدمن كحول، تعاطى الأفيون في المدرسة، وفصل من العمل مرتين! ​In the days when an ice cream sundae cost much less, a 10 year old boy entered a hotel coffee shop and sat at a table. A waitress put a glass of water in front of him. ​Once upon a time a daughter complained to her father that her life was miserable and that she didn’t know how she was going to make it. She was tired of fighting and struggling all the time. It seemed just as one problem was solved, another one soon followed. A man's favorite donkey falls into a deep precipice; He can't pull it out no matter how hard he tries; He therefore decides to bury it alive. There was a farmer who had a horse and a goat…..One day, the horse became ill and he called the veterinarian, who said: - Well, your horse has a virus. He must take this medicine for three days. I’ll come back on the 3rd day and if he’s not better, we’re going to have to put him down. Nearby, the goat listened closely to their conversation. The next day, they gave him the medicine and left. 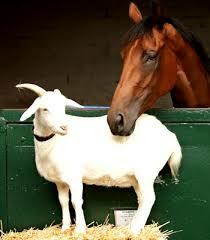 The goat approached the horse and said: - Be strong, my friend. Get up or else they’re going to put you to sleep! - Unfortunately, we’re going to have to put him down tomorrow. Otherwise, the virus might spread and infect the other horses. After they left, the goat approached the horse and said: - Listen pal, it’s now or never! Get up, come on! Have courage! Come on! Get up! Get up! ​The Lesson:* this often happens in the workplace & life in general . Nobody truly knows which employee or people actually deserves the merit of success & are in fact contributing towards success , or who’s actually contributing the necessary support to make things happen. Be grateful.